Wisewire is a learning design company dedicated to engineering revolutionary materials to achieve your school's vision. Our DNA at Wisewire is learner-centered design and development. Our learning materials have been adopted by 48% of institutions in the United States and are used by 2.2 million students. This unique approach jumpstarts foundational course development. It's faster to market and helps students achieve career goals thru industry recognized learning paths. 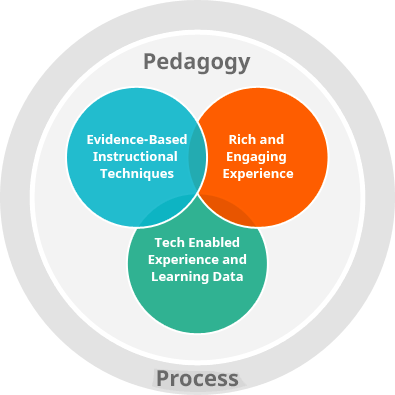 We believe the learning experience is as important as student progress; therefore, we design for the best experience possible while still optimizing for data and reports. Dedicated to engineering revolutionary learning materials, the Wisewire team consists of over 2,500 subject matter experts, data scientists, learning architects, and interaction designers who all work together toward a common goal. Learning environments are not the same across institutions. As such, our materials are designed to adapt to your model with the best student experience and learning-data fidelity. K–12, AP: We have designed next-generation learning materials that provide everything needed for project-based learning (PBL) and assessments in math, ELA, science, and history. College-Level Courses: We provide course frameworks to jumpstart development. Frameworks consist of competencies and objectives, content, assessments, and learning resources. We know that providing an engaging experience and getting reliable evidence of learning are key. Each learning object is designed to be an efficient bridge from the objective to the assessment.